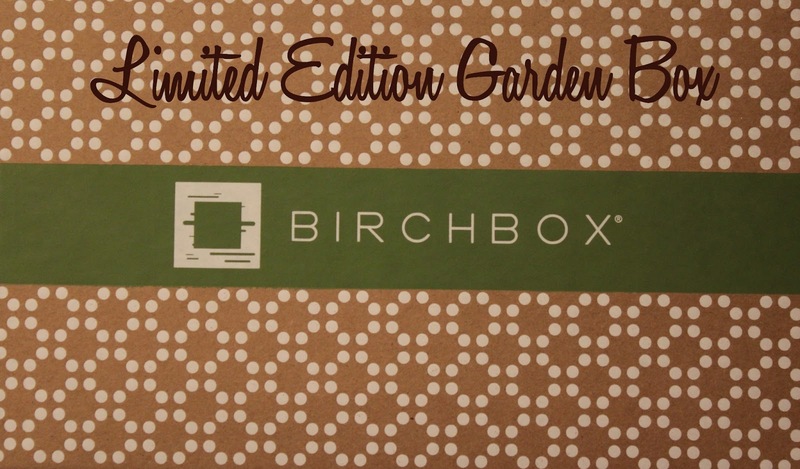 Landing On Love: Have Your BirchBoxed Yet? In February, I lost my will and succumbed to the temptation that is Birchbox. 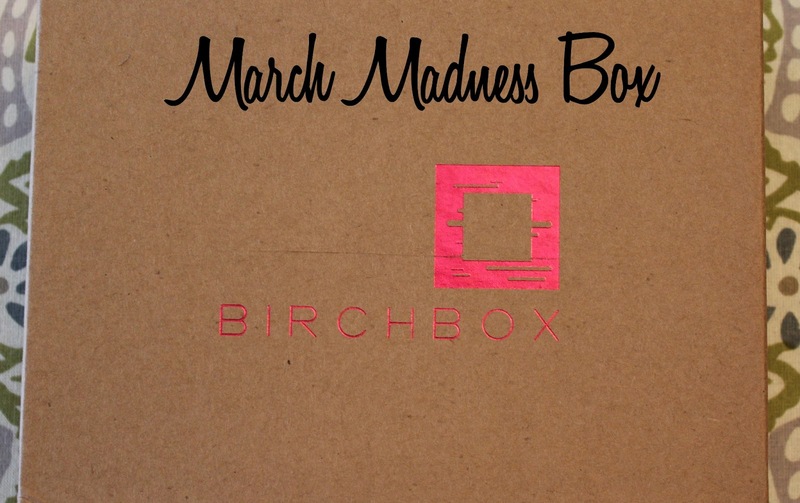 After seeing several other bloggers reveal their box of goodies each month, I made the executive decision that I needed to be a part of that too. I mean, why wouldn't you? You can give up the cost of one fast food lunch a month for a thinner waistline and a hand-delivered box of great samples - done! I received my first box in March and wasn't all that impressed. The head-band was great, and I loved the nail file from Madewell. The nail polish stickers are very neat, but I haven't tried them yet. The shaving cream was fun, but not too different from my current Skintimate shaving cream. 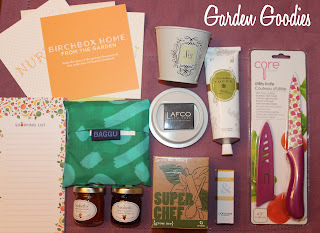 My second box came a few weeks ago and I felt a little differently; I loved it all. I've used both samples of the Oribe Shampoo & Conditioner. I love the smell and how soft it makes my hair. I drank up the two Kusmi Tea samples within the week and will be ordering more. The 'Sweet Love' sample was amazingfest! This Mirenesse lip-stick gloss is amazing. It is such a great color for summer and it lasts! It makes my lips soft and I definitely will be purchasing more. Loving all the #tinytweaks! 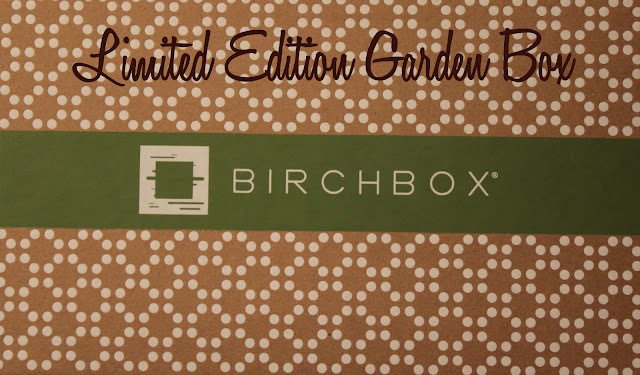 BirchBox also does limited edition boxes every few months. This month was garden themed, and I was smitten. It was $34.00 for all these goodies. I'm still digging in. I don't know what it is, but I love getting packages. So much so that I practically race Tanner to the mailbox every day. 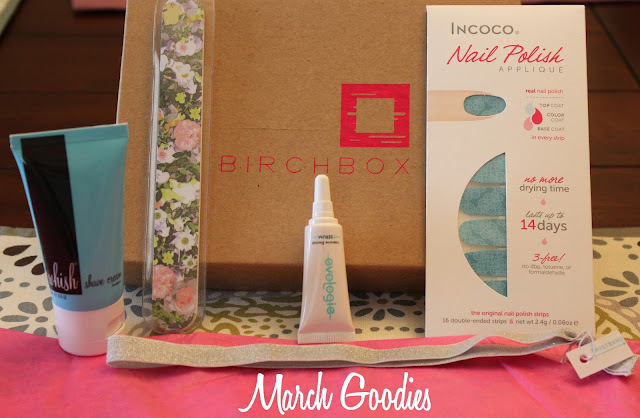 It got me thinking, there has to be more services like Birchbox available for the package lovin women in the US...and there is! POPSUGAR - $35.00: This service will send you $100 worth of full-size products that are hand-selected by their editors. Stitch Fix - $20.00 + Cost of Clothes: You start this service with a style quiz that helps stylists pick out 5 fashion pieces for you each month. These pieces are sent to you door for you to try on, then you can choose what you want to keep and return. It costs $20.00 for the style service and then you receive 25% off on items you choose. TestTube - $29.95: This service will send you deluxe and full-size products from the hottest beauty brands every other month. Members will also receive a subscription to NewBeauty magazine, delivered quarterly. Le Parcel - $15.00: This service will make that time of the month a little easier. Subscribers recieve an assortment of pads, tampons, pantyliners (you select 30 of whatever you use), plus a few pieces of chocolate and a surprise bonus item (makeup or a watch).You also choose the day you want it to arrive. How nice is that?! IPSY - $10.00: This service will send you a beautiful glam bag with deluxe samples and full-sized beauty products each month. Members can also watch how the stylists use these same products on YouTube! Are you subscribed to any monthly product delivery services? Sparkles of everything design and events!